When you shine a beam of light on your hand, you don't feel much, except for a little bit of heat generated by the beam. When you shine that same light into a world that is measured on the nano- or micro scale, the light becomes a powerful manipulating tool that you can use to move objects around – trapped securely in the light. "Previously holographic traps were limited to particular classes of light (scalar light), so it is very exciting that we can reveal a holistic device that covers all classes of light, including replicating all previous trapping devices," Professor Andrew Forbes, team leader of the collaboration and Distinguished Professor in the School of Physics where he heads up the Wits Structured Light Laboratory. "What we have done is that we have demonstrated the first vector holographic optical trapping and tweezing system. The device allows micrometer sized particles, such as biological cells, to be captured and manipulated only with light." The final device could trap multiple particles at once and move them around just with vector states of light. The experiments for this study were performed by Nkosi Bhebhe as part of his doctoral studies. The work is published in Nature's on-line journal, Scientific Reports. In their paper titled "A vector holographic optical trap," the Wits researchers showed how to create and control any pattern of light holographically, and then used this to form a new optical trapping and tweezing device. 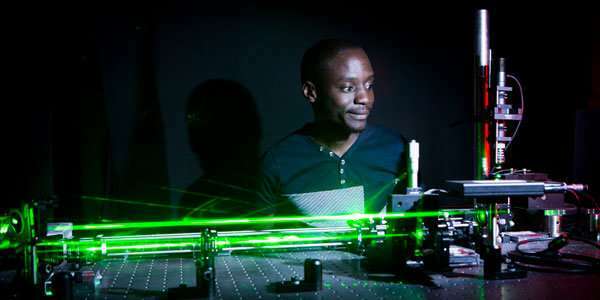 "In particular the device could work with both the traditional laser beams (scalar beams) as well as more complex vector beams. Vector beams are highly topical and have found many applications, but no vector holographic trap was possible until now," says Forbes.